Scott Davidson got Kilsyth's winner at Irvine Victoria. 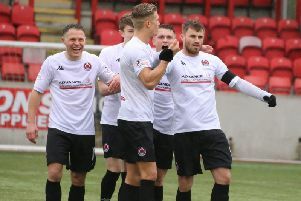 An early strike from Scott Davidson was enough to keep Kilsyth Rangers top of the table with a 1-0 win at Irvine Victoria on Saturday. There are no easy games in the Super League First Division, as was shown as Rangers struggled against the third from bottom Ayrshire side. However they did hold on to secure the victory and remain clear of Shettleston in second place for at least another couple of weeks with cup ties intervening. to fire a low shot past Chris Lamb. For the next 20 minutes it was all Rangers and the question was how many would they score. However it was not to be all one-way traffic and in almost their first foray upfield Jamie Anderson put the ball in the net for the home side but rather late the referee decided that the player had been offside and the goal did not count. From that point onwards Victoria gained in confidence and began to make a game of it. Rangers still had the better chances but their finishing was poor and they could not get the second goal that might have settled them. Just before half-time Anderson put in another fine effort which was blocked by Andy Carlin; unfortunately for Vics he was then taken off with a foot injury and replaced by Grant Bolton. There was a very good restart by the home side; within a minute they had hit the Rangers crossbar and had another strike go narrowly over. Then Eddie Ablorh hit the base of the post and Kilsyth defender David Waters headed another effort off the line. Rangers were living dangerously at this point but gradually regained their composure. Alan Flannigan replaced Davidson quite early in the second half but it was very much a game of equals now with Victoria looking just as likely to score as Rangers. Further changes from both sides as the game entered its latter stages, Corey Pearson coming on for David Sinclair for Kilsyth and David Adams replacing Kevin Adam for Irvine. Near the end Rangers were reduced to 10 when Paul McBride was shown a red card for a stupid reaction when fouled but it made little difference to the course of the game. In fact Rangers had several good chances in the last few minutes but there was only the one goal in it at the final whistle, a slightly fortunate three points, but the fans went home happy with the result, if not neccessarily the manner in which it came. Kilsyth:Carlin, Waters, K McBride, Doyle, Tyrell, McGee, F Kelly, Sinclair, Davidson, P McBride, Prentice. Subs. Munro, McGlinchie, Flanagan, Pearson, Duke. Irvine Victoria: Lamb, Mears, Kirkland, Condon, Wilson, Scaramuzza, Anderson, Davidson, Adam, Ablorh, Singleton. Subs. Adams, Thomson, Chesney, Bolton, McDonald.